Want to store your food storage in Mylar bags? Here are 8 tips for using Mylar bags for food storage you’ll want to know. 1. Mylar bags are not rodent proof. Plan accordingly. Put your bags into rodent proof containers like plastic bins, buckets, or metal barrels. 2. Mylar bags are reusable. Unlike a #10 can, once you use the contents of a Mylar bag, you can wash that bag out and seal it again. To make the most of bag size, seal near the top and cut the bag open as close to your original seal as possible. 3. You can use a large bag to make smaller bags and all you need are some scissors and a clothing iron. One 5 gallon Mylar bag makes 4 bags that are approximately gallon sized. Or you can cut them even smaller and store individual meals or items like batteries. 4. Mylar bags come in a variety of thicknesses, each with its benefits and drawbacks. A 7 mil bag is really thick and sturdy, but not very flexible if you’re wanting to line a container with it. 3 mil are really thin and flexible. For storing my own food I use 4.5 mil or higher. 5. Bags thinner than 4 mil may let light through them in addition to being very thin. They’ll probably need to be stored in a container. Mice love an exposed Mylar bag! 6. You can make your own bags from recycled Mylar bags that held commercially processed foods. 7. Sealing a Mylar bag is easy with the right heat source. Commercial impulse sealers are ideal, but expensive. You can also use a clothing iron, hair straightener, or for smaller sized bags you can use the heat strip on a vacuum sealing machine like a FoodSaver. 8. Don’t forget to label your bags with the contents, date packed, expiration date, and cooking instructions! You don’t want a bunch of mystery silver bags in your storage. You can write right on the bag with a sharpie or use a stick on label. So, what would the 7 mil bag be best for storing? I would never trust plastic as being rodent proof. The 7 mil bags are really sturdy and thick. I have stored food packed in 7 mil bags that were then placed in 55 gal drums. I had no concerns that those food pouches would get punctured or break even though they were all just piled in the container together. I have just been introduced to your site and find it so fabulous! Thanks for sharing what you have learned with those who want to work to be more self-reliant! I had a question, I love the idea of putting a bunch of the same mylar bags (i.e. macaroni) in the same LARGE container…I hadn’t thought past 5 gal. buckets! What kind of 55 gallon drums would you be using? Water barrels? I’m newer to this whole endeavor but we are eager to make progress. Would you be able to break down your storage for me? I want to get a whole picture of how this is going to work and how to accomplish it. Such as a list for oxygen absorber counts and where to use them etc. Even a picture of your storage room would help to process how to accomplish this! Maybe this is in your new book?! Thanks again! I would highly recommend my new book. It has all the breakdowns of foods to store and how to store them including all the information on oxygen absorbers and how many of what size to use for what container. Great tips. Do you recommend using oxygen or moisture packs in the bags as well? Yes. I use oxygen absorbers in the bags. Typically 100-200 cc’s for a gallon size bag and 1000 cc’s for a 5 gallon bucket. If one is going to store the bags in a larger container (to protect from rodents) how are mylar bags any better than the bags I already use with my FreshSaver vacuum sealer? Or are they? Seems to me the only benefit is that they keep light out, but if I store my vacuum sealed stuff in an opaque container I’ve essentially got the same benefits. Vacuum sealer bags are not very puncture proof. I have stored dried apples in them that were not even dried crispy and they poked holes through the vacuum sealer bags. For storing smaller grained items like flour or even rice, the vacuum sealer bags work fine, but any dry goods with sharp edges can easily poke through them. Labeling is so basic, but so many, myself included, seem to forget. I can’t tell you how many times I’ve forgotten to label a bag only to have to open it to find out what is in it. Thank you for your post. You mention using Commercial impulse sealers, my husband got me one but there are no real instructions on how to use it. Would you have any tips you could pass on? You can also portion size using a gallon mylar by sectioning off a portion, fill with the goodies, carefully seal with a curling iron or regular iron, and place the second batch next, and carefully sealing and so on. I use this when packing snacks for my hubby when he bikes… just leave enough space to cut the top or bottom section without cutting open the next section (both stay sealed until opened). Saves money also on the mylar bags. Are the tamper resistant load from the bottom zip seal mylar bags just as good for very long term storage as the regular mylar bag? Yes, before you open them, they are sealed just as well as those that don’t have the zip seal. great post. 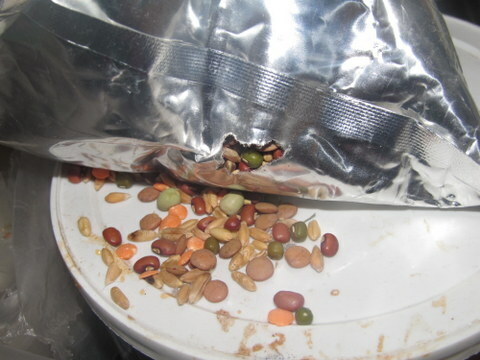 once I left my sealed mylar bags in the pantry and a rodent chewed a hole in it. ever since then, I did the same thing you suggest,,, I now put the sealed mylar bags in a 5 gallon plastic bucket, and I haven’t had that problem since. Storing food is not an easy task while you are in long travel. 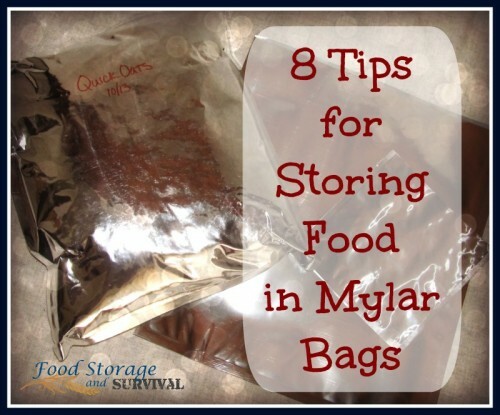 These are really useful tips for storing food in mylar bags. Mylar storage bags are excellent to store food in because then you don’t really have to worry as much about storing the items in food plastic bags.